NOTE. I enclosed “Management” in the title of this post in quotes. That was deliberate. If I had used a more appropriate term, say “Epistemology,” or “Theory of Knowledge,” you probably would not be reading this now. 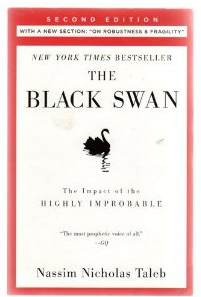 After recently reading Nassim Nicolas Taleb’s fine new book “Antifragile.” I decided to re-read his earlier book written in 2007, “The Black Swan.” This time I bought the Second Edition (2010), and spent a part of each day of my recent vacation reading it in depth. I read it the first time much too quickly. Let me say first I found an unexpected kindred spirit in Taleb, and I am in awe of his erudtiion and logical clarity. It is a powerful and important work, and deserves reflection on almost every page. I now plan to read it a third time. It hasn’t been since I read Dawkins “The Greatest Show on Earth” that I could almost feel my cortex creating new networks and associations, even though I was reading this each morning after evenings in The French Quarter in New Orleans. Of course, the savory, dark N.O. coffee and Beignes may have helped considerably. In subsequent posts I will attempt to summarize the connections and lessons I think apply to my day-to-day practice of Agile Knowledge Management and Business Intelligence. ← Hobo 2.0 for Rails 3.2 Released!